The Aquatic Plants collection at the Conservatory features a beautiful indoor raised infinity pond so it's easy to view the plants up close. Let's explore this beautiful gallery! 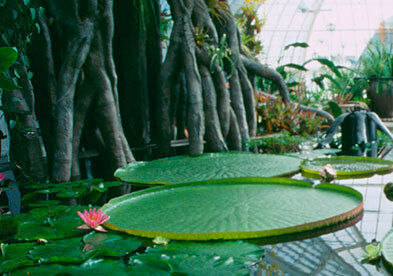 The star of the aquatic collection is the Victoria amazonica water lily, which can span up to six feet in diameter and made it's North American debut at this very Conservatory in the late nineteenth century. Unfortunately, these were not available for viewing during my trip but they did have a lovely art deco life-sized sculpture in brass and glass which was quite unusual. The view across the pond. Some additional flowers in the gallery. Final stop: the Potted Plants Gallery. How beautiful! I love the tiny, rosette like leaves. Is it a plant that needs to have high water levels?